An interactive whiteboard resource to accompany a puzzle published in an old book by Henry Ernest Dudeney. The puzzle is a useful one for teaching deeper mathematical thinking because while it can be solved by trial and error thinking about the maths behind it can make it much easier. 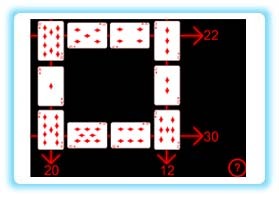 The goal is to choose a number that all 4 sides of the frame can add up to and arrange the cards to do this. Some numbers are possible some numbers are not. This puzzle has been selected as it allows students of all abilities to have a go as the maths involved is not difficult. The challenge should be to find a method of determining what numbers can be used as the common total amount and then how to make finding the layout much easier. The resource provided here allows the puzzle to be demonstrated easily and can also allow whole class discussion of how to approach the problem. Clicking on one card and then another causes them to swap places. The resource totals the different lines automatically. The original wording of the puzzle can be made to appear by clicking on the question mark button. A printable sheet accompanies this resource which includes the original wording and diagram. It also includes the appropriate cards for cutting out to do the puzzle away from a computer. If teachers would like the solution and maths behind it leave a comment with your email address in the box (it will not be published). There will be at least a 5 day delay to ensure that students who have been set this as homework aren’t cheating by impersonating a teacher! Can I have the solution to this problem please? Many thanks. could I have the ‘maths behind it’ info please. my group has been working with the problem and having lots of fun. I’d love to recieve the solution and maths behind this problem. I will use this in September. This seems like a great extra credit assignment could I get the solution? Thanks! I really would love your solution to this please, orignal request made in July. Thanks! Sorry you haven’t received it; it was sent on 3rd of August. I’ve sent it again today . Check it isn’t being put into to the junk folder. If you or anybody else still hasn’t received it let me know here. Would love to receive the solution to this problem and the maths behind it. Could you please send the answer and the maths behind it – thanks! Love the resources! Please may I have the solution to this problem. Thanks. AAH! The Year 7’s and I still can’t work it out. Help please! Sorry for delays in sending the solutions – I’ve been away normal service now resumed. I will appreciate it if you could send me an sollution. Please can we have a solution! It was fun working on this problem with my children, will be thankful if you could send me its solution. Thanks. Great resource. Could I have the maths behind it and solution please. Thank you. Great activity. Can I have the maths and solution please. Good to hear that it proved an interesting challenge for him. 25 mins is pretty quick to solve it on your part too! can I please have the solution???? it is a gret problem and the kids are loving it but can’t figure it out!! can I please have the solution and the maths behind it please?